A paper model of Tolomato Cemetery by preservationist Matt Armstrong. One of the purposes of the TCPA is to preserve the cemetery and its features. Groups of volunteers work on restoring the ironwork, cleaning and preserving the grave markers and other stone features, and keeping the enthusiastic Florida vegetation from taking over. We have also undertaken projects with professional assistance, which we have paid for from our donations. 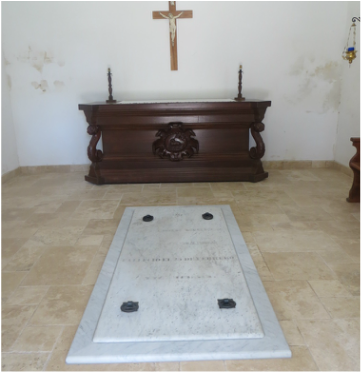 Recently, an important marker, the door on the now-empty crypt in the Varela Chapel was cleaned, restored and reset in a marble crib, and the chapel was refloored with a material that was similar to the original material. Originally paved with coquina or tabby, it had been covered with a terracotta tile in the 1970s. The original marble crib had disappeared, and the stone had been left in a gaping hole cut in the floor at the time of the removal of a casket from the crypt in the 1980s. But we brought it back to its former dignified appearance, although using travertine rather than coquina, since the latter material is not only hard to obtain but hard to maintain as indoor flooring. The Varela stone prior to restoration. A 19th century photo of the interior of the chapel. The interior of the Varela Chapel as restored in 2014. We announce our preservation work days to members and other interested people, and anyone is welcome to join us. The NCPTT (National Center for Preservation Training and Technology, a National Parks Service entity) has held workshops there, and we hope to have more such events in the future.